Earlier this year, we brought you word (here) of the Sans-13, the first crowd-funded watch from Smith & Bradley (you can see my hands-on review of it right here). When I met with the company, they had said they were planning an automatic for the future. Well, that future has arrived, and Matt Himmelstein is giving us his thoughts on their recently-launched Kickstarter campaign. 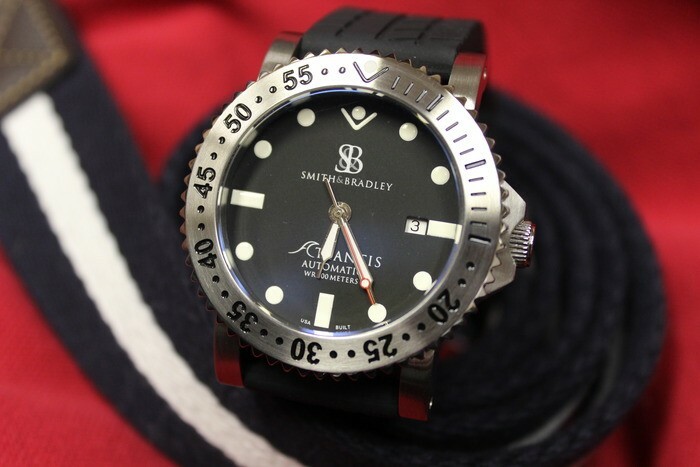 With one successful campaign under their belt, Smith & Bradley is back for a second shot at crowdfunding a watch, this time an automatic diver (project page), the Atlantis. As a refresher, the first campaign (again, here) was for a tactical watch with tritium lume. They ended up with 203 pledges and they raised $41,000 against a $16,000 goal. In looking at the comments for that project, the watches were delivered about a month late (which is pretty much on time for crowd funding) and they were generally well liked. The negative comments seem to be grouped around the cyclops (too small, but not included in the Atlantic) and the lume, which I think is more a misunderstanding on the part of the backers on what to expect. (Editor’s note: a discussion of the dimmer tritium is here). The Atlantis is an automatic (The Sans 13 was a quartz) assembled in Sidney,Illinois from Swiss, German, and Chinese parts. The movement is a Seagull ST 2131, and the hands and face are also sourced from China. The case is stainless steel made in Germany, and the Sapphire crystal is from Switzerland. The hands and bezel use superlume, so they should be quite a bit brighter than the Sans 13. It is rated to 200 meters, which should be fine for any recreational diving, and is more than sufficient for the non-diving daily wear that most of these watches will see. Styling is pretty straightforward, nice and clean for a diver, but not remarkable. Thew watch is a stout, but not comically oversized 44mm (without the crown) and the black silicone strap has a nice asymmetrical tread pattern. Right now (December 31), the are about 1/2 way to their goal, with all the early bird $350 watches sold out. The next tier buys you a watch in exchange for a $375 pledge. If you miss out on that, the final level is $400 for a watch. Delivery is scheduled for May, which puts it in the range of Father’s Day and Graduation (and my birthday).